We’re moving back to Calgary today. We’re moving back to Calgary today. Hey, hey, we’ve moving back to Calgary TODAY! But this isn’t our average ‘ol move, this is a move of epic proportions because we’ve decided to make this a road trip move. Montreal to Calgary. 9 days, 2 dogs, a cooler full of RISE Kombucha, and a propane cooking stove. This is going to be epic. After AMJ Campbell picks up our stuff later today, Kevin, the dogs and I will start making our way westward. We have no plans, no expectations… we’re just going to drive. 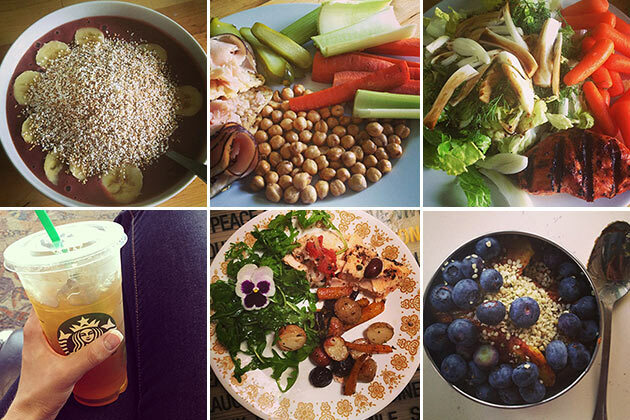 Also, it’s Friday which means it’s our second installment of What A Nutrition Educator Eats – where I hit you up with new meal ideas, go-to quick snacks and healthy choices that I live out on the daily. Let’s get this delicious party started! I get my veggies in early by frying them up with some apple cider vinegar, spices and a bit of oil. 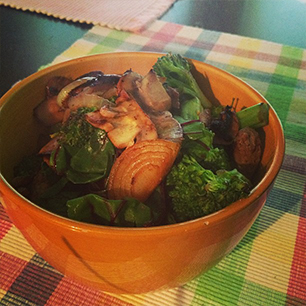 This bowl has onions, mushrooms, broccoli, kale and bits of chicken. 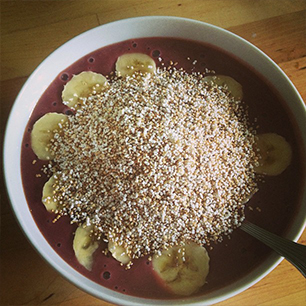 Instead of drinking up my smoothies in a glass, I serve them in a bowl and top them off with fruit, grains, nuts or seeds so that I take longer eating them. 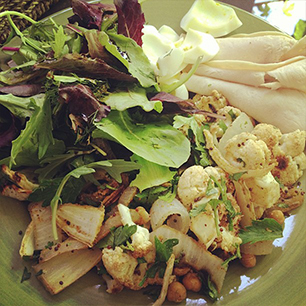 Cauliflower salad for breakfast. ‘Nough said. My all-time favorite chicken marinade is a mixture of gluten-free soy sauce and red curry paste. 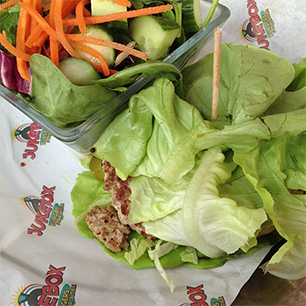 If you’re grain-free, opt to have your burger served up with a couple leaves of romaine instead of the bun. One of our favorite burger places in Montreal is Jukebox Burgers. 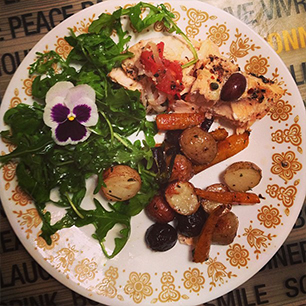 Lemon juice and arugula goes great with barbecued salmon and roasted veggies… a gluten-free, dairy-free meal our friends made up for us during our last week in Montreal. Coq au vin is one of my very favorite stews. 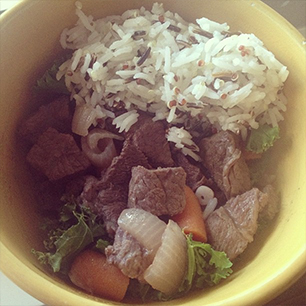 We used to enjoy stew with loads of crusty bread, but now I like mine on a big bed of kale and rice. Snack plates are my favorite when I can’t commit to eating just one thing. 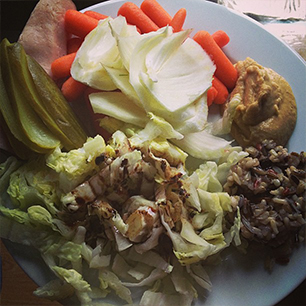 This plate is loaded up with hummus, carrots, fresh fennel, wild rice, romaine lettuce, pickles and chicken. I fried up some plantains with coconut oil and a sprinkle of cinnamon. After they were out of the pan, I topped them with hemp seeds (for protein) and fresh blueberries. 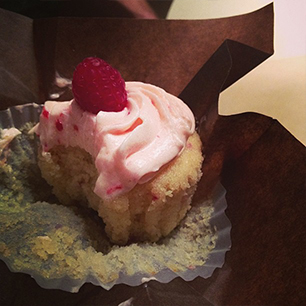 We ordered gluten-free, dairy-free cupcakes from Almond Butterfly for our friend’s birthday this week. They were SO good that we each ate two! 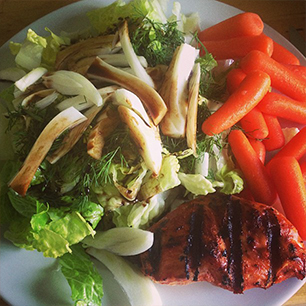 What’s your favorite way to get your veggies in? 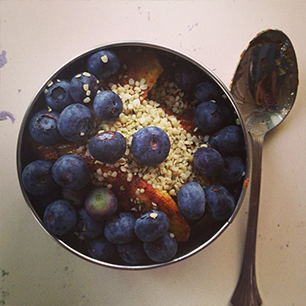 Is there a bakery in your area that serves up healthier alternatives?